Sticking to a winning formula certainly works for father and son Billy and Philip Stewart, who farm at Bomakelloch near Keith. With a proportion of the flock kept pure, stock tups are bought in. 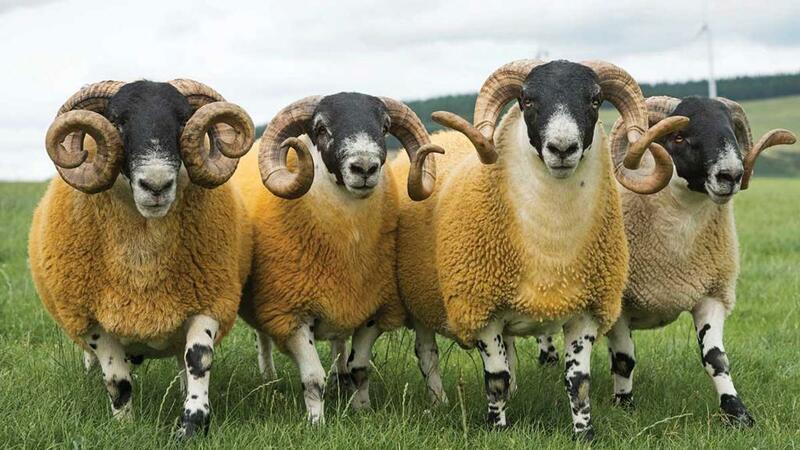 Over 30 years they have built up a reputation for producing top lots of Scotch Mule ewe lambs out of North-type Blackface ewes. The Stewarts pioneered using the Bluefaced Leicester as a crossing sire in their corner of north east Scotland when others were still using the Border Leicester and they were quickly rewarded for making the change. For the 30 years since United Auctions opened its mart at Huntly, the Bomakelloch draws have regularly topped the trade at the September sales of Scotch Mule ewe lambs. The buyer of the top lots has been the same since that first sale, so there has been no obvious need to change breeding policy. Many Mule producers have moved over to crossing type of Blueface Leicester, but Billy and Philip have stayed loyal to the traditional type looking for tups with a good frame, plenty of character, tight wool and especially with a good mouth and legs. For several years they have bought the majority of their tups at United Auctions Huntly and Stirling from Robert Neil, at Broadleys. They also use tups bought from the Ingrams at Logie Durno and Matthew Seed at Auchry. The Stewarts are equally specific about the type of ewe they use. They buy-in ewe lambs each year to keep their 530-strong flock up to strength. 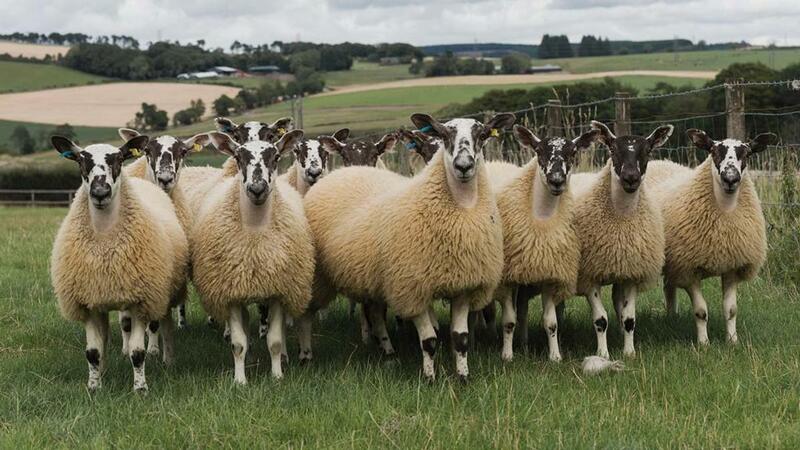 Traditionally known as the ‘Perth-type’, the North-type Blackface has its heartlands in Angus, Perthshire, and the area around Glenlivet, but there are a number of top breeders further south producing the sort of lambs which suit the Bomakelloch system. The Stewarts go to Lanark market each autumn buying mostly from Calla, Woolfords, Low Drumclog and formerly Knoweton. Philip says: “We always buy the North-type for crossing. They are far bigger framed sheep and they produce the bigger framed Mules which a lot of buyers prefer. Among the 530 ewes kept for crossing, the Stewarts run pure flocks of 80 North-type and 30 South-type ewes. 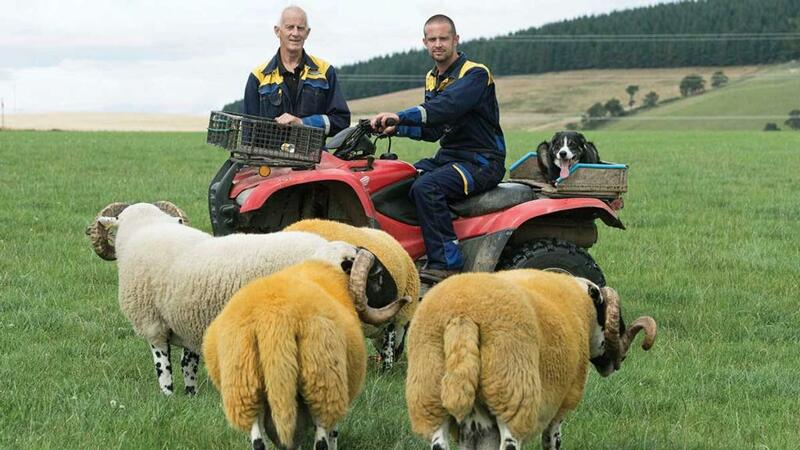 Billy Stewart (left) with son Philip and North type Blackface tups at Bomakelloch, near Keith. The duo have built up a reputation for producing top lots of Scotch Mule ewe lambs. Stock tups for the pure Blackfaces are bought-in, with the latest North types purchased at Stirling last October from Achdregnie and Calla. “We usually achieve 150 per cent lambing,” says Philip. The ewes, which can produce between five and seven crops in the crossing flock, are outwintered and fed a mix of homegrown oats, dark grains and soya meal from early February. They also have access to turnips for an hour or two every day in the fortnight before and during lambing. The ewe lambs for breeding are sold over two sales at Huntly, with about 275 consigned in total. Their top price in 2017 was £128 per head with an average of £106.50. A price of £138 per head was achieved in 2016 for the top pen and is their highest price to date. The wedders go to McIntosh Donald at Porthlethen at 43kg liveweight to produce a 20kg carcase. Showing is part of the scene too with this season’s haul including a championship at Banchory with a ewe lamb by the Achdregnie sire.